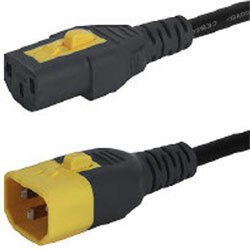 A comprehensive selection of European, Australian, American, Chinese, Japanese, and interconnection to IEC C13 or C19 mains power cord sets from Schurter, with the V-Lock interlocking system are available now from RS Components. The V-lock system is intended to stop accidental disconnection, the yellow coloured catch mechanism is simply released by depressing the built-in lever, removing the needs for additional hardware, decreasing costs, and installation time. Applications for these RoHS compliant V-Lock cable assemblies include laboratory equipment, portable medical devices, telecommunication and datacom equipment, and audio equipment. Suitable for appliances with protection class I.